Marley is famous at his vets for being an angry difficult to deal with character so grooming has always been a stressful experience for everyone involved. Not the case with Anita though, she knew exactly what to do to calm him down and stop him from felling scared. For the first time he came away from a grooming relaxed and stress free. Anita also gave great advice and grooming tips on little things we can do at home to make Marley a happier, cleaner cat. If you have found yourself on this page, are a cat guardian and live in South London, then it’s more than likely that you will be seeking a cat groomer to visit your home to groom your cat. 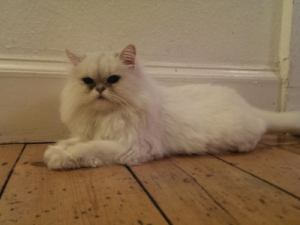 Marley was happy with Catnips London cat grooming service and your cat will be too!